Pakistan cricketer Umar Akmal spars during a training session at The Punjab Cricket Association (PCA) Stadium in Mohali on March 26, 2011. Pakistan bowler Shoaib Akhtar warms up with an exercise ball during a training session at The Punjab Cricket Association (PCA) Stadium in Mohali on March 26, 2011. Pakistan cricketer Shoaib Akhtar jumps in air during a training session at The Punjab Cricket Association (PCA) Stadium in Mohali on March 26, 2011. Pakistan cricket captain Shahid Afridi goes towards the nets during a training session at The Punjab Cricket Association (PCA) Stadium in Mohali on March 26, 2011. Pakistan cricket captain Shahid Afridi plays a shot during a training session at The Punjab Cricket Association (PCA) Stadium in Mohali on March 26, 2011. Pakistan cricketer Misbah-ul-Haq plays a shot during a training session at The Punjab Cricket Association (PCA) Stadium in Mohali on March 26, 2011. Pakistan bowler Shoaib Akhtar rests during a training session at The Punjab Cricket Association (PCA) Stadium in Mohali on March 26, 2011. Pakistan's Younis Khan, right, talks with a fellow team member as police officers stand guard during a training session in Mohali, India, Saturday, March 26, 2011. 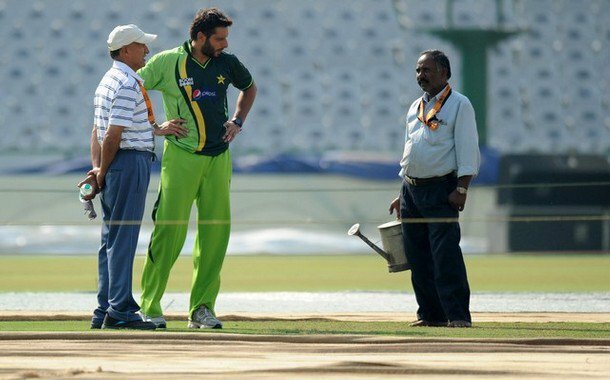 Pakistan cricket captain Shahid Afridi (2L) talks with groundstaff while inspecting the pitch during a training session at The Punjab Cricket Association (PCA) Stadium in Mohali on March 26, 2011. Pakistan wicketkeeper Kamran Akmal rests during a training session at The Punjab Cricket Association (PCA) Stadium in Mohali on March 26, 2011. Pakistan cricket captain Shahid Afridi stretches during a training session at The Punjab Cricket Association (PCA) Stadium in Mohali on March 26, 2011. 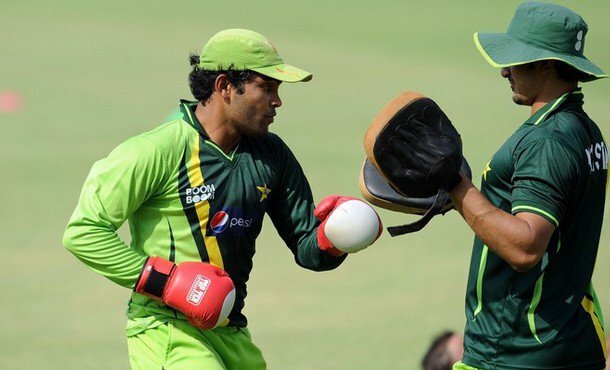 Pakistan cricket captain Shahid Afridi (L) along with teammates Kamran Akmal (C) and Abdur Razzaq look on during a training session at The Punjab Cricket Association (PCA) Stadium in Mohali on March 26, 2011. Pakistan cricketer Misbah-ul-Haq (R) boxes during a training session at The Punjab Cricket Association (PCA) Stadium in Mohali on March 26, 2011. 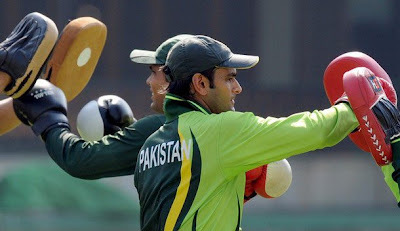 Pakistan cricketer Younus Khan (R) gestures during a training session at The Punjab Cricket Association (PCA) Stadium in Mohali on March 26, 2011. Pakistan cricketer Umar Gul (R) boxes during a training session at The Punjab Cricket Association (PCA) Stadium in Mohali on March 26, 2011. Pakistan cricket captain Shahid Afridi excercises during a training session at The Punjab Cricket Association (PCA) Stadium in Mohali on March 26, 2011. Pakistan cricketers Kamran Akmal (L) and Mohammed Hafeez spar during a training session at The Punjab Cricket Association (PCA) Stadium in Mohali on March 26, 2011. 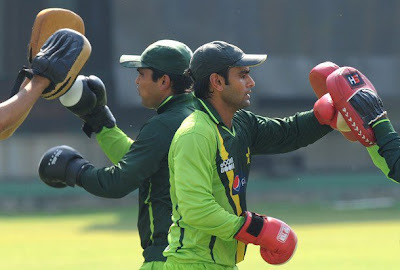 Pakistan cricketers Kamran Akmal (L) and Mohammed Hafeez boxe during a training session at The Punjab Cricket Association (PCA) Stadium in Mohali on March 26, 2011. Pakistan captain Shahid Afridi stretches during a training session at The Punjab Cricket Association (PCA) Stadium in Mohali on March 26, 2011. Pakistan are scheduled to face India in an ICC Cricket World Cup 2011 semi-final match at the stadium on March 30. Pakistan cricketers, captain Shahid Afridi (L) and Abdur Razzaq run during a training session at The Punjab Cricket Association (PCA) Stadium in Mohali on March 26, 2011. Pakistan wicketkeeper Kamran Akmal (2L) boxes during a training session at The Punjab Cricket Association (PCA) Stadium in Mohali on March 26, 2011. Pakistan bowler Shoaib Akhtar (Top) jumps in air to cross a hurdle as Umar Akmal (R) warms up during a training session at The Punjab Cricket Association (PCA) Stadium in Mohali on March 26, 2011. Pakistan bowler Shoaib Akhtar (L) jumps in the air to cross a hurdle as Umar Akmal (R) warms up with an excercise ball during a training session at Punjab Cricket Association (PCA) stadium in Mohali on March 26, 2011. Pakistan cricketer Shoaib Akhtar runs during a training session at The Punjab Cricket Association (PCA) Stadium in Mohali on March 26, 2011. 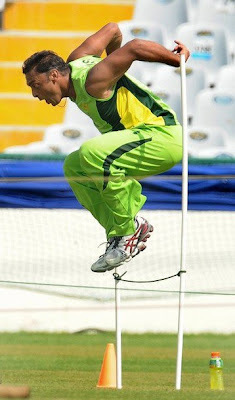 Pakistan bowler Shoaib Akhtar (R) jumps in air to cross a hurdle during a training session at The Punjab Cricket Association (PCA) Stadium in Mohali on March 26, 2011. 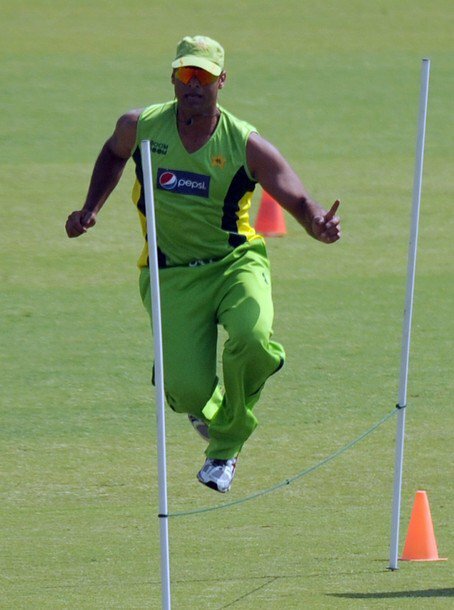 Pakistan bowler Shoaib Akhtar jumps in air to cross a hurdle during a training session at The Punjab Cricket Association (PCA) Stadium in Mohali on March 26, 2011. Pakistan captain Shahid Afridi jumps to cross a hurdle during a training session at The Punjab Cricket Association (PCA) Stadium in Mohali on March 26, 2011. Pakistan fast bowler Shoaib Akhtar holds a ball during a training session at The Punjab Cricket Association (PCA) Stadium in Mohali on March 26, 2011. Pakistan fast bowler Shoaib Akhtar boxesduring a training session at The Punjab Cricket Association (PCA) Stadium in Mohali on March 26, 2011. Pakistan cricketers Shoaib Akhtar (R), Kamran Akmal (2R) and Misbah-ul-Haq (C, top) warm up with others during a training session at The Punjab Cricket Association (PCA) Stadium in Mohali on March 26, 2011. 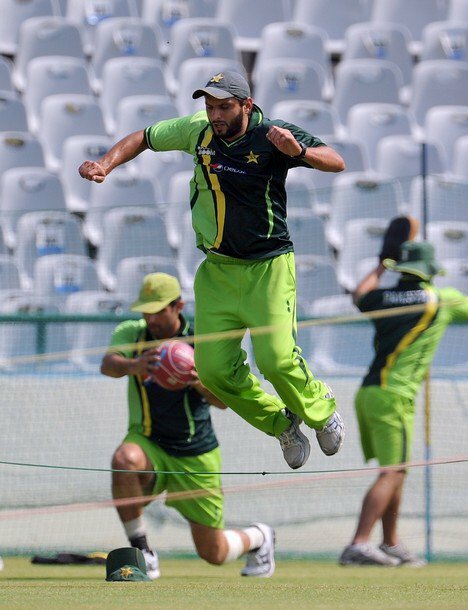 Pakistan cricket captain Shahid Afridi (C) jumps to cross a hurdle during a training session at The Punjab Cricket Association (PCA) Stadium in Mohali on March 26, 2011. Pakistan cricket captain Shahid Afridi (R) boxes during a training session at The Punjab Cricket Association (PCA) Stadium in Mohali on March 26, 2011. Pakistan bowler Umar Gul spins a football during training session at Punjab Cricket Association (PCA) stadium in Mohali on March 26, 2011. Pakistan cricketers Wahab Riaz and Umar Gul (L) play with a football during a training session at The Punjab Cricket Associaton (PCA) stadium in Mohali on March 26, 2011. Pakistan cricket captain Shahid Afridi stretches during a training session at The Punjab Cricket Associaton (PCA) stadium in Mohali on March 26, 2011. 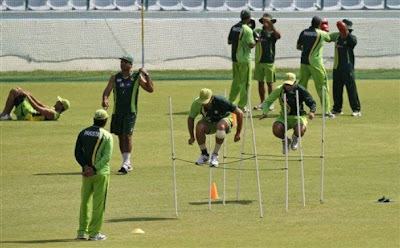 Pakistan team members train during a practice session ahead of the semifinal match against India in Mohali, India, Saturday, March 26, 2011.